Owing to the influence of the Gulf Stream, the archipelago of Bermuda has a very mild climate, but it is not a tropical paradise, at least in winter. Annual precipitation is around 1,400 millimeters (55 inches); the rains are fairly evenly distributed over the seasons because the flow of weather fronts in winter is replaced by the tropical rains of the summer months. Anyway, the least rainy months are April and May, while the rainiest month is October. Here is the average precipitation in Hamilton, the capital. In winter, from November to March, temperatures are very mild, with lows around 15/17 °C (59/63 °F) and highs around 20/22 °C (68/72 °F). Sometimes the weather is nice and the sun shines, but this kind of weather is not always guaranteed: in fact, there is no shortage of rainfall, so much so that there are about 11/13 rainy days per month, and there can be windy days as well. Summer in Bermuda is hot and muggy, with highs around 30 °C (86 °F) in July and August, although the heat is tempered by the breeze. There are about 10/12 days of rain per month, but usually in this season the rain comes in the form of short and intense showers and thunderstorms, which break out in the evening and do not affect much the amount of sunshine. The hours of sunshine in Bermuda are not many from November to March, when there are several cloudy days, while from April to September, the percentage of sunshine is good. The sea is cool in winter, when the water temperature is around 19/20 °C (66/68 °F), while it becomes pleasantly warm from June to October, with a maximum in August, when the water temperature reaches 28 °C (82 °F). Sometimes the archipelago can be hit by hurricanes. The hurricane season runs from June to November, although they are more likely from August to October. In general, hurricanes do not hit Bermuda at the peak of their violence because the ocean at this latitude is not as warm as the Gulf of Mexico, however, they can still bring strong winds and heavy rains. Some hurricanes that hit Bermuda with considerable intensity were the "Hurricane of Havana and Bermuda" in October 1926, Hurricane Emily in September 1987, Fabian in August 2003, Arlene in August 1963, Fay and Gonzalo, both in October 2014, and Nicole in October 2016. 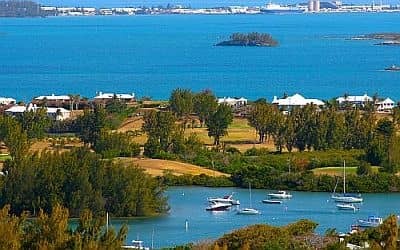 Because of its favorable climate, you can visit Bermuda all year round, in winter to relax, play sports or explore nature, and in summer for swimming and sunbathing. In summer, however, there's some risk of hurricanes. All in all, April and May seem to be the best months, especially May, at least with regard to weather conditions, since it's still a bit cool for swimming: the daytime temperature is around 24 °C (75 °F), while the sea temperature is around 21 °C (70 °F). From December to April: bring light clothes, but also sweatshirt or sweater, a jacket and umbrella. From June to September: bring summer clothing, a light sweatshirt and a light raincoat for thunderstorms.